The premise, retrace his route from his travel narrative that shot him to fame with his Great Railway Bazaar. It was a book published in 1975 recounting his railway journey from London to Asia, Japan and Back through the Trans-Siberian express. 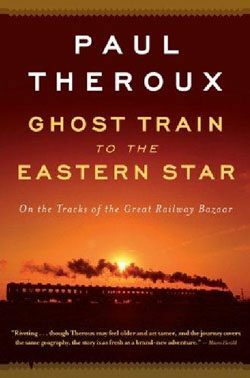 30 years later, around 2005, Paul Theroux, now much mature, relived the journey which resulted to the book Ghost Train to the Eastern Star. I have never read his Great Railway Bazaar but I found it wasn’t a problem with this book as we would give glimpses on what it’s like on his first journey. In fact each chapter can stand alone, like if you want to read a portion on Japan or Vietnam, it would not be a problem. But take heed this is not a guide but more of a personal account and he does it with exceptional writing. He’s a keen observer and touches a lot on the social and the political state of a country. His narrative is fluid and emotional at times but can be brash and egotistic as well. But one thing is for sure, he is a very good writer even if I sometimes don’t really agree with his views. What I really enjoyed is portions where he met up with different authors I also enjoy reading like Haruki Murakami and Pico Iyer in Japan or Isaac Asimov in Sri Lanka. I’m glad to read about these authors for a change and to have them traveling together in one book was exciting. It also gave me an idea of how the mind of a travel writer likes Theroux works, learning about his method on recording while he travels. I also like his encounter with strangers which is really the heart of this book. It’s not entirely about the destination or the passing scenes from his cabin window. It is also about his fellow passengers, his tuk-tuk drivers, the landlords and his guides. His intelligent questions to strangers led them to open up their stories for him to note down. He may sometimes be too critical with his meticulous descriptions of people to the point of insult but I think that was his honest way to get back at them. I took me quite a while to finish the whole book, not because it was dragging or lengthy but because of my lack of time to read. But I never got lost picking up the book from where I left off. Ghost Train to the Eastern Star is one of the non-fiction travel books I was really engaged reading when I start flipping through the pages again. There are a lot of insights in this book not only about a destination but for a traveler himself shaped by his journey. I love the “Great Railway Bazaar”, and I am hoping to someday take an epic journey on a train. I would rather take the train than fly, if given the choice.